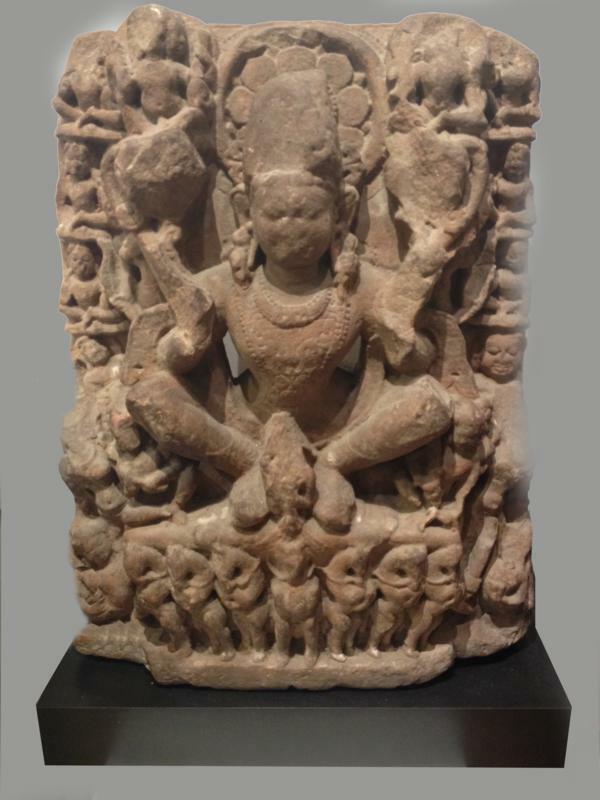 India, Rajasthan or Madhya Pradesh, 11th to 12th Century AD. The segment of a wall or small temple represents the sun God, seated, elaborately framed, with a rounded halo behind his head and holding lotus blossoms in each upraised hand. He is depicted riding a chariot, whose curved front bar can be seen under his feet and above a row of rearing horses. He wears an an intricate headdress. He is surrounded by smaller attendant figures. Surface wear and losses attests to it age; a rare composition. Compare 31 & 44 in The Nasli & Alice Heermaneck collection. Size: 25-1/2 inches (64.7cm) Height x 18-1/2 inches (47cm) Wide x 6-1/2 inches (16.5cm) Deep + custom mount. Ex Brooklyn NY Private Collection.